There are many different volunteer roles in the Scouting program. In fact there are over 6,000 adult volunteers just in our council, Dan Beard. Training helps Leaders/volunteers to understand and support their specific role in Scouting. Over the decades, the Boy Scouts of America has been a leader in developing training and policies designed to keep young people safe. Over time, these policies have become standard with organizations across the nation. All Leaders and those actively volunteering with the Pack MUST complete Youth Protection Training. No Leader can be registered without first completing youth protection training. Please follow this link to access the training website. By October 1, 2018, all new and currently registered leaders will be required to complete the updated Youth Protection Training. The enhanced and updated content will allow leaders to comply with all current legal requirements across all states. 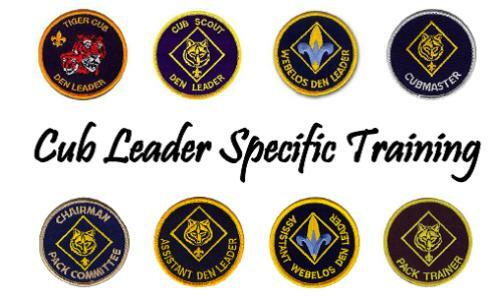 Position Specific Training is a course required for registered Leaders of all Scouting program levels to earn their "Trained" status. The Position Specific Training program is tailored to the specific position that the Leader holds. It provides the specialized knowledge a new Leader needs to assume a leadership role. Position Specific Training is available online at the BSA Learn Center through my.scouting.org, you can also attend a training taught by informed volunteers on a district or council level. To see what the Position Specific Training Requirements are, see downloadable document below.